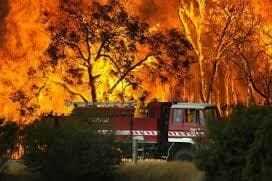 The Victorian Bushfire Royal Commission was developed and launched to investigate the 2009 Black Saturday bushfire, which destroyed over 1000 homes and claimed 173 lives. The commission recommended that the Victorian Government collaborate with a number of electrical distribution companies to investigate whether 'Rapid Earth Fault Current Limiter' (REFCL) technologies would reduce the likelihood of fires initiated by falling overhead electrical power lines, such as that which occurred on Black Saturday. HRL was engaged by the Victorian Government (DSDBI/DEDJTR) to develop a methodology to test a number of commercially-available technologies, and determine which was the most effective at preventing a fire in the event of a falling wire. The tests needed to be performed on live networks without any disruption to customers, and take into account typical network characteristics such as changes in temperature, humidity, and moisture. HRL developed and built a first-of-its-kind test rig to allow a safe means of testing 'Fault on ground' scenarios that accurately replicated the worst-case bushfire conditions. Using this test rig, HRL developed a safe control system that allowed for up to 50 tests per day, using high-speed data and image collection, live HD video, and infrared video. HRL successfully tested two REFCL products: a 'Ground Fault Neutraliser' (GFN) and a 'Solid State Fault Current Limiter' (SSFCL). HRL found that the GFN is able to reduce fire risk of wire-on-ground faults by a factor of ten. However, modifications to the SSFCL could make it perform similarly to the GFN. New legislation will be drafted based on the outcomes of this project. This legislation will determine the maximum allowable voltage and current of a wire-on-ground fault, and will influence the number of REFCLs to be installed in Victoria. The legislation will also regulate whether there is a need for independent commissioning of each REFCL device and testing requirements.